In today’s profile for Library and Archives Canada’s blog series First World War Centenary: Honouring Canada’s Victoria Cross recipients, we remember Private Harry Brown, who was awarded the Victoria Cross for his actions during the Battle for Hill 70 on August 16, 1917, in France. …continued on through an intense barrage until he arrived at the close support lines and found an officer. He was so spent that he fell down the dugout steps, but retained consciousness long enough to hand over his message, saying, ‘Important message.’ He then became unconscious, and died in the dressing station a few hours later. Due to Brown’s courage and determination, his message was delivered and reinforcements were sent. He is credited as saving both the unit’s position on Hill 70 and the lives of many of his fellow soldiers. Private Harry Brown was awarded the Victoria Cross posthumously. He is buried at Noeux-les-Mines Communal Cemetery, near the towns of Lens and Béthune, France. 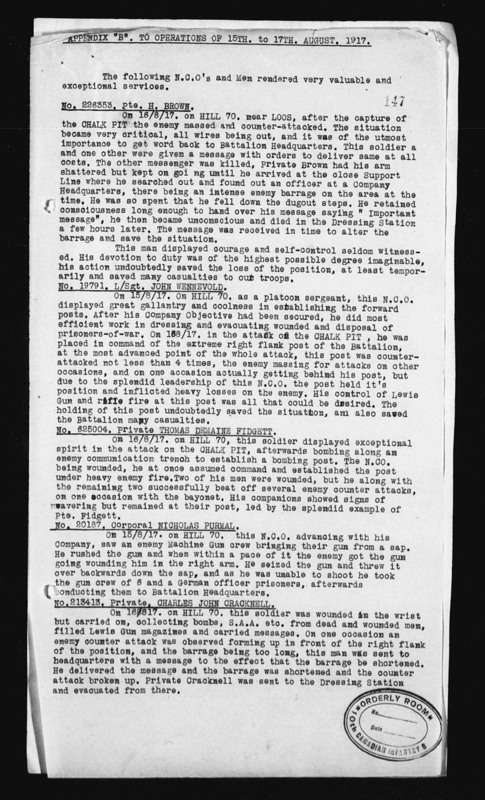 Library and Archives Canada holds the service file for Private Harry Brown. Thank you very much for this posting. Harry is a great great uncle of my daughter’s. My husband tells of playing in his grandmother’s attic and coming across Harry’s VC stored in a drawer. Up to that time he did not know about his great uncle. We have had a family friend seek out his gravesite in France and one day we would like to go there as well. Such a valiant young man.